Heat 1 tablespoon zesty onion EVOO in a 12-inch skillet over medium-high heat. Add the beef and cook until well browned on both sides. Remove the beef from the skillet. Pour off any fat. Heat the remaining zesty onion EVOO in the skillet. Add the onion and pepper and cook for 1 minute, stirring occasionally. Add the garlic and cook until the vegetables are tender-crisp, stirring often. Stir the soup, water, balsamic vinegar and rosemary in the skillet and heat to a boil. Return the beef to the skillet. Reduce the heat to medium. Stir in the spinach. Cover and cook the beef for 2 minutes for medium or until desired doneness. 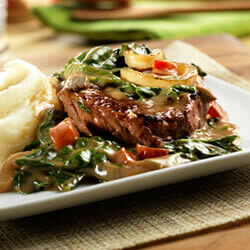 Serve the beef and vegetable mixture with the potatoes. Stir the broth, garlic mushroom EVOO, jerk seasoning and garlic cilantro balsamic vinegar in a 2-quart shallow, nonmetallic dish or resealable gallon-size plastic bag. Add the steak and turn it over to coat with the marinade. Cover the dish or seal the plastic bag and refrigerate it for 8 hours, turning the steak over a few times while it's marinating. Lightly oil the grill rack and heat the grill to medium. Remove the steak from the marinade and pour the marinade in a 1-quart saucepan. Heat the marinade over medium-high heat to a boil. Reduce the heat to low. Cook for 10 minutes. Stir in the lemon juice. Keep warm. 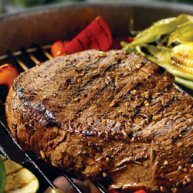 Grill the steak for 28 minutes for medium-rare or to desired doneness. Let stand for 10 minutes before slicing. Serve the heated marinade with the steak or pour on top.